On February 20, 1437, King James I was murdered at Perth. He left a son, James II, and six daughters, one being the wife of Louis XI of France. King James II was the son of King James I and an Englishwoman, Joan Beaufort. He was born on October 16, 1430 at Holyrood Palace in Edinburgh. He became king in 1437 on the death of his father and was crowned a month later on 25 March. As usual, the time of the regency was one of civil discord; the Douglases were then very powerful, one of them being regent. 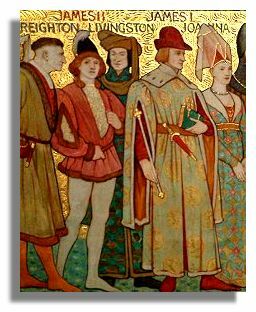 After the death of the regent in 1439, Sir Alexander Livingston of Callendar imprisoned James' mother Queen Joan and her new husband in Stirling Castle and only released them when he was given custody of the king until he became of age. The power of the Douglases was further reduced in 1440 when they were invited to what became known as the "Black Dinner" in Edinburgh Castle attended by the ten-year-old King James. His cousins, the young Earl of Douglas and his brother were murdered on the orders of the governor of the castle, Sir William Crichton, a member of another powerful family. Sir Alexander Livingston was also implicated in the crime. James married Mary, daughter of the duke of Gueldres, in 1449. Included in her dowry were cannons which were superior to anything known in Scotland at that time. Of his four sons, the eldest became James III. In 1449 James assumed power and one of his first acts was to imprison Sir Alexander Livingston and forfeit his lands. James then invited the 8th Earl of Douglas to Stirling Castle and requested him to break his liaison with the Earl of Ross and the Lord of the Isles. When Douglas refused, James stabbed him and his bodyguard killed him. Although the murder resulted in a civil war, James was successful in quelling the Douglases - those cannons gifted as part of the dowry came in useful. In 1455 Parliament forfeited the Douglas estates and a number of the Douglas castles became crown property. James became also involved in a war with England. Later he took up arms for the Lancastrian party in the struggle for the English throne but was killed whilst besieging the English occupants of Roxburgh Castle, August 3, 1460. He was buried at Holyrood Abbey.